What is the number one problem with owning any tool? Simple, there is always someone out there that is willing to steal it from you if given the opportunity. The problem is, nothing is unstealable. We can only do our best to make it as hard for them to steal as possible. My friend learned about this the hard way when all of his tools were taken from the back of his truck. When I saw the Skyd Cable Locking System, I knew this was the product that would have saved his tools. The problem for my friend was that it was just too easy to unbolt the cargo tie-down that his chain was looped through. 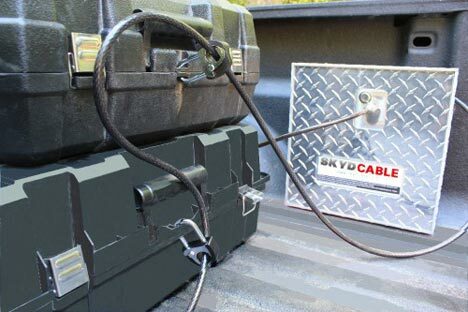 The Skyd Cable Locking System is a complete truck cargo locking system that uses only one key and one lock to lock everything. The system uses a 20-foot, 3/8” vinyl-coated braided-steal cable that is housed in a small 14” x 14” x 6”, 3/16” thick diamond plate aluminum box. After pulling the cable out of the self-retracting box, which is bolted to the bed of your truck or trailer, you can then thread it through all of your tools. The end of the cable is then placed inside of the box where it is locked with a cam-lock. The retracting mechanism even has a built-in centripetal force safety brake to prevent cable snap backs. The system also allows users to use padlock, without the need for extra keys. This is done with special Skyd Locks that do not require any keys or combinations. Skyd Locks are innovative keyless padlocks that are designed to simultaneously lock your toolboxes while securely locking your toolboxes to your Skyd Cable. Because Skyd Locks are locked by threading a cable through the actual lock, there are no keys or combinations to hassle with. You can add as many Skyd Locks to the Skyd Cable as you need, and all that is required to unlock everything is a single key. Both the Skyd Cable and the Skyd Lock come with a lifetime warranty to the original owner. The Skyd Cable System comes with everything mentioned above, and includes 2 Skyd Locks, for $395. Additional Skyd Locks can be purchaced for $9.95 each.